The Waterman Perspective Blue Ballpoint Pen CT creates a sense of presence whenever you use it. Inspired by architectural designs, this ballpoint pen stands out with classic vivid blue lacquer and chrome trims that highlight the eye-catching splendor of an original graphic style. The ballpoint pen opens and closes with a retractable twist mechanism and the fine tip is ideal for precise writing. 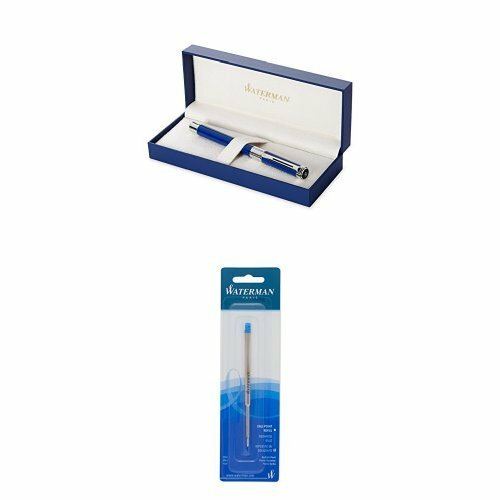 Presented in a beautiful Waterman gift box, this luxury pen bundle also comes with an extra blue ink refill to extend your writing pleasure. If you have any questions about this product by Waterman, contact us by completing and submitting the form below. If you are looking for a specif part number, please include it with your message.